MORGANTOWN, W.Va. (August 10, 2018) – Tune in to MAVTV this Saturday, August 11 at 9:30 a.m. ET and/or 12:30 p.m. ET for the ATV Motocross National Championship (ATVMX) presented by CST Tires to watch round seven – Sunset Ridge ATVMX National highlight show from Walnut, Illinois. Don’t miss all the action as the ATVMX Series as the temperatures and humidity rose throughout the entire weekend. As racing began, you could tell it was going to be a thriller to see which racer could put together a race that brought them out on top and to the center of the box. The gap between the leaders grew shorter quickly and soon they were pulling a sizable gap over the rest of the AMA Pro ATV field as Hetrick was pressuring Wienen for the lead. When the gate dropped for moto two, it was looking to be just as exciting as the first moto. Hetrick got a good start, taking the SSi Decals Holeshot Award and eagerly stepping up the pace to try and keep this moto under his control. Wienen had a mid-pack start and would spend the first lap getting through traffic before he could make a run at the leader. Brown was running in second, and for several laps the Yamaha mounted duo would test each other through every turn and over every jump. 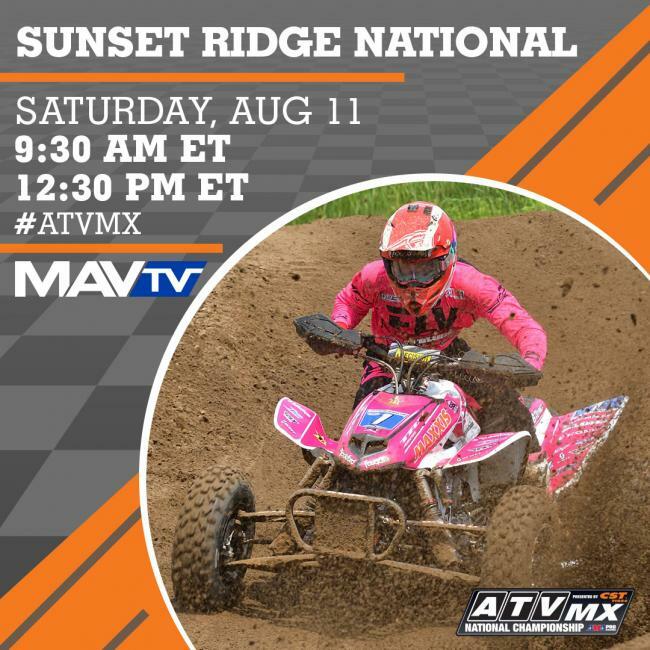 Catch all the action from round seven at Sunset Ridge ATVMX National at 9:30 a.m. EST or again at 12:30 p.m. EST. Use the MAVTV Channel Finder to determine the channel for MAVTV in your area.